An idea was implanted, (no this is not Inception 😉 ) while I was going through a discussion which was about using OutlineLoad utility. Cameron Lackpour made a comment stating that soon there’ll be a GUI interface for OutlineLoad. 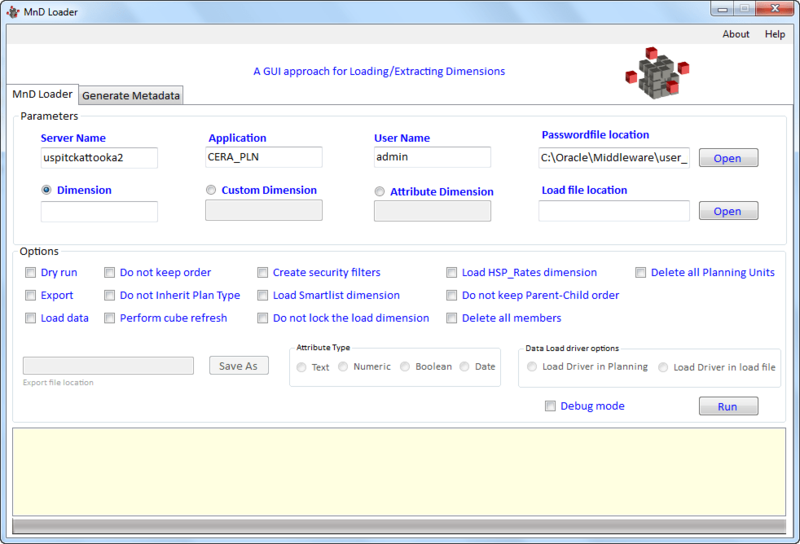 To give you an idea about what I’m talking here are the screenshots of MnD Loader. It makes “intelligent selections” (if you select export, all other options expect the ones you can use with an export will be disabled). Remembers the last used server, application, user, password file. It has an interface to develop metadata files. Enough of what I developed, let’s see what’s new about Outline Load web interface. Outline Load from Web is a simplified version of the familiar command line version. It will show onscreen whether the load was successful. Just mention the dimension name and it’ll export the dimension. I was hoping that a fix will be added to the issue of multi-lined formula getting split into different lines. I was interested in seeing “Export Data to File” option with this. So I went ahead and starting testing it. [Fri May 17 15:47:42 EDT 2013]Unable to obtain dimension information and/or perform a data load: An error occurred while running the specified calc script. Well, so we are writing a data export calc script using this 😉 Essbase logs revealed that there is some syntax error in the calc script!!!!! Data Export Completed. Total blocks: . Elapsed time: . Total Number of Non-Missing cells exported: . Then I decided to run my earlier export (with level 0 of Accounts and level 0 of Period) and to my surprise it started working and now Essbase log is complaining about exporting a dynamic member. 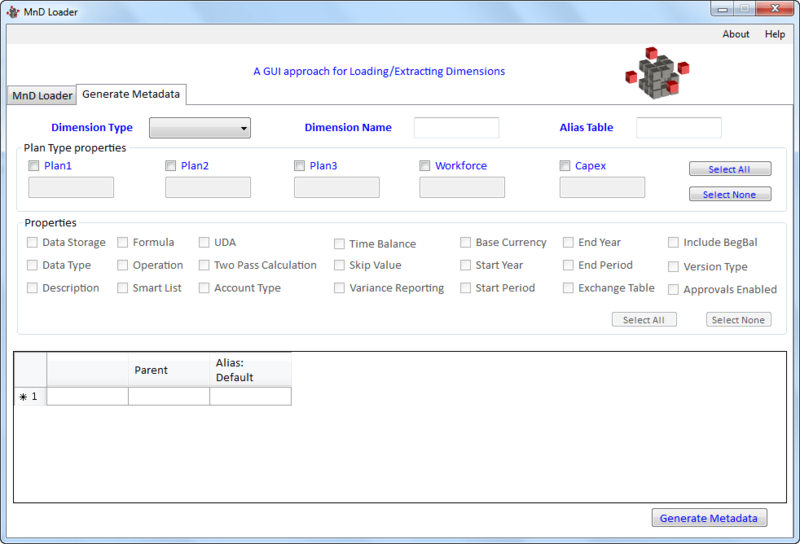 DataExport detects Dynamic Calc member  in the range. Exporting Dynamic Calc data may slow down performance. This DataExport operation will export data from existing blocks only. Any FIX on sparse dynamic calc members will be ignored. Use DATAEXPORTNONEXISTINGBLOCKS ON option to export data from all potential blocks. Data Export Completed. Total blocks: . Elapsed time: [0.01]. I think they should’ve added options not to extract dynamic calc members. Naaa it was some internal scripting that they to reach the final output. Web export (Outline Load) uses a DATAEXPORT calc script and exports data to a tmp folder. and later gets converted to Outline Load format. Overall it is a nicer simpler approach. My takes on the new interface. I don’t think this will make a bigger difference, however it would have been nice if these options were in there. Instead of POV option for selecting Page members (multiple members from same dimension). Make it work always, I tried a second time before writing this post and the same error of invalid calc script occured. Multi-lined formulas extract as a single line. All options of Oultine Load – load Smart List, Exchange Rates. As always an interesting one..keep going…all the best. . I am not able to extract missing values using this feature. I think it does not allows loading or extracting missing values. Is that correct? Deep, that is the feature of DATAEXPORT. So if all rows are missing it'll not export those rows.